I am not the biggest fan of comedies and generally shy away from romantic comedies. In my opinion, they tend to be cliché full and most times unrealistic and impractical. From the above you may have guessed right that I don’t believe in drama-full romance; in fact I have come to dislike a lot of ‘epic’ love stories like Romeo and Juliet, Rose and Jack, Elena, Damon and Stephan and most recently Olivia and Fitz…. Tueh! I just cannot stand the fuss, or maybe I’m just not normal. So when I got the invite to watch the premiere of ‘When Love Happens’, I wasn’t the most excited…. unfortunately, I was otherwise engaged and could not make the premiere. However, the fact that the producers of the film had taken time out to invite ‘film critics’ to screen the movie made me somewhat curious and I eagerly went to view the film immediately it was released in the cinemas. Did my curiosity pay off or was it just another Nollywood drama we could have done without? I guess you have to read on to find out. 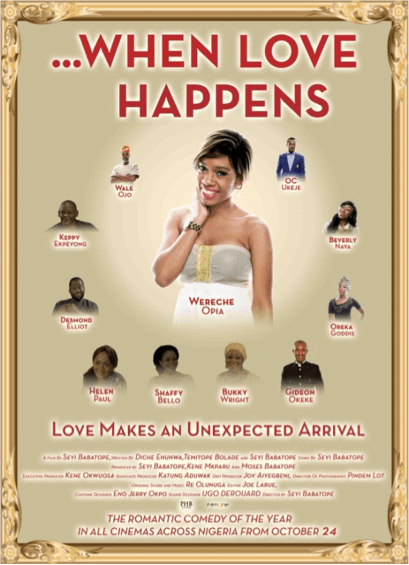 ‘When Love Happens’ is the story of Moduroti Bankole – Smith, a twenty eight year old Event Planner that has always been unlucky in love. As usual with tales like this, love is bubbling all around her and there’s a close male best friend in the mix but nothing seems to be going well for her in the love department. Anyways to make matters worse, one of her friends that she feels that, ‘she beta pass’, has just got engaged and she’s been hired to plan the event. Kai! This movie is helmed by a director I have not had the opportunity to encounter before and has an actress I’m seeing for the first time in Wereche Opia, so, I didn’t know what to expect. But, as I have come to savor more frequently in recent times, there was a breadth of fresh air that oozed from this movie. Wereche Opia is a gem to look out for in the movie industry. She wore her part like a glove and was a convincing girl in desperate need to settle down. I know she and a lot of the other actors had their accents flying around like swords, however, it all blended in well with the upper middle class background they were trying to portray in the film. Now may I be permitted to talk about Oreka Godis….. Omo this girl is foinneeeeeeeee!!!! Abeg, I don’t know if it was her carriage, her persona or those braids, but every time she came on the screen my heart was just fluttering at her ‘fineness’. Biko Oreka, if you are reading this, me I will not waste time like Tobe o, I think you are a fine girl, Shikena! Back to my review…… This is the first time that I am watching one of these comedy like Nollywood films and I’m not ticked off by one element or the other. The cast genuinely had chemistry together and felt so natural, well maybe except Beverly Naya, I’ve still not come to feel relaxed watching her on screen. Keppy and Shaffy were the epitome of cool, head over heels in love parents and I will echo the sentiments of some of the viewers in the cinema who wished, ‘their mothers’ were as cool as Shaffy’. O.C Ukeje had this brown beard thing going on which my jury is still out on and Bukky Wright kinda over played the proud mother trying to hook her son up, but those are minuscule when placed beside the top notch picture and sound editing, really nice score and continuation, intelligent script and superb direction by Mr Babatope. In a short space of time I have watched three Nollywood movies in the cinema and I have had a good time each time. This gives me great hope and I look forward to more and more movies of this cadre. When Love Happens has given me my first Nollywood feel good experience and I’m sure you would agree with me if you took some time out to watch this. (I was genuinely laughing all over the place; not because the director cast one over the top comedian to toss in the constant comic relief, but because the script and performances were quite hilarious). If you have seen this, take the time out to drop your comments below, if you haven’t, then what are you waiting for? Feature: Which one have you made?